湖泊科学 2016, Vol. 28 Issue (1): 31-39. DOI: 10.18307/2016.0104. 刘国锋, 韩士群, 刘学芝, 何俊, 藻华聚集的环境效应:对漂浮植物水葫芦(Eichharnia crassipes)抗氧化酶活性的影响. 湖泊科学, 2016, 28(1): 31-39. DOI: 10.18307/2016.0104. LIU Guofeng, HAN Shiqun, LIU Xuezhi, HE Jun. The environmental effects of algae bloom cluster:Impact on the antioxidant enzyme activities of water hyacinth (Eichharnia crassipes). Journal of Lake Sciences, 2016, 28(1): 31-39. DOI: 10.18307/2016.0104. 摘要：利用以水葫芦为代表的水生植物进行水体生态治理, 具有环保、生态和可持续发展的优点.然而, 在外源和内源污染尚未完全控制的情况下, 夏季蓝藻水华仍然会频繁暴发.系统研究水生植物对藻华聚集后形成的逆境环境下的生理适应机制可为减轻藻华聚集的不良影响、充分发挥水生植物的水体净化功能发挥重要作用.以水葫芦为代表, 采用模拟实验, 研究在高温阶段(水温>25℃)、水华聚集下对水葫芦关键酶活性的影响及其环境效应, 以揭示蓝藻水华聚集后引起的浅水生态系统中水生植物消亡的深层机理.结果表明, 藻华聚集会很快消耗掉水生植物根区内的溶解氧, 水体呈现缺氧状态(溶解氧 < 0.2mg/L); 植物根区内氧化还原电位值出现明显下降, 实验进行1d后低于-100mV, 实验结束时达-199.9mV, 水体呈现强还原环境.植物叶片中丙二醛(MDA)、超氧化物歧化酶(SOD)、过氧化物酶(POD)含量呈现快速增加的变化趋势, 至实验结束时添加120g/L的处理组中其含量分别为2.17μmol/g(FW)、266.497U/g、1988.60U/(g·min), 而叶片中过氧化氢酶(CAT)呈现快速下降的趋势, 至实验结束时其含量为6.09U/(g·min); 根系中MDA、POD至实验结束时其含量分别为0.57μmol/g(FW)、525.161U/(g·min), 呈现快速下降的趋势; SOD、CAT含量在实验结束时高达221.71U/g、35.10U/(g·min), 表现为快速增加的趋势.水葫芦关键抗氧化酶活性的变化, 表明藻华长期聚集、腐解带来的水体缺氧等不良条件对植物产生了环境胁迫作用, 较长时间影响(>5d)下对植物产生了严重的伤害作用; 同时也表明藻华严重聚集及藻细胞腐解产生的环境胁迫是漂浮植物水葫芦无法生长乃至死亡的主要影响因素.因此, 在利用水生植物进行水体净化的工程实践中, 要避免蓝藻的严重堆积, 以减轻藻华暴发对植物的不利影响和充分发挥植物的水体净化功能. Abstract: Using the floating plants water hyacinth(Eichharnia crassipes)to purify the polluted water has possessed the advantages of environmental protection, ecological and sustainable development. However, the algae blooms are frequently occurred in the summer and caused the massive nutrients(mainly phosphorus and nitrogen)accumulation, which often becomes the pollution sources of water body. It is vital of systematic studying the physiological adaptation mechanism to the adverse environment formed by the algae blooms gathered, and is helpful to reduce the adverse effects of algal bloom, in order to give full play the purification effects of aquatic plants. In this simulation, the change of key enzymatic activity of floating plant water hyacinth was studied as the algae cells gathered at higher temperature(water temperature>25℃). The environmental effects on the water hyacinth after algae cells gathered were studied at the same time, which are helpful to reveal the deep mechanism of floating plants in shallow-water ecosystem caused the algae cells dead. The results showed that the dissolved oxygen in water in the root-zone of plant consumed quickly and became anxious in 2h after algae cells gathered. The ORP decreased to lower -100mV in 1st day. It reduced to -199.9 mV and the water became the strong oxygen-reducing environment from the 2nd day to the end of the experiment. 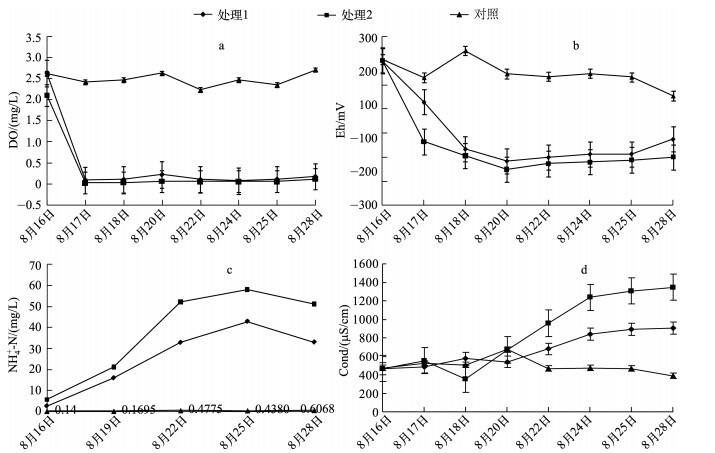 Concentrations of MDA, SOD, POD in leaf increased quickly after algae cells gathered, and the concentrations of the enzyme concentration of experiment treatment 2 in plant leaf rose to 2.17μmol/g(FW), 266.497U/g, 1988.60U/(g·min)at the end, respectively. However, the concentration of CAT in leaf reduced quickly during the experiment, and its content reduced to 6.09U/(g·min). 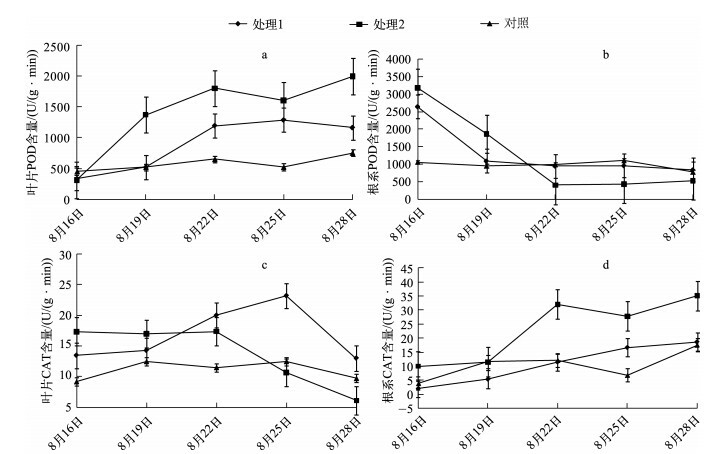 Also the concentration of MDA and POD in the root of the water hyacinth declined rapidly and its content reduced to 0.57μmol/g(FW) and 525.161U/(g·min), respectively. But the content of SOD and CAT in root increased to 221.71U/g and 35.10 U/(g·min)during the period of the experiment after algae cells gathered. 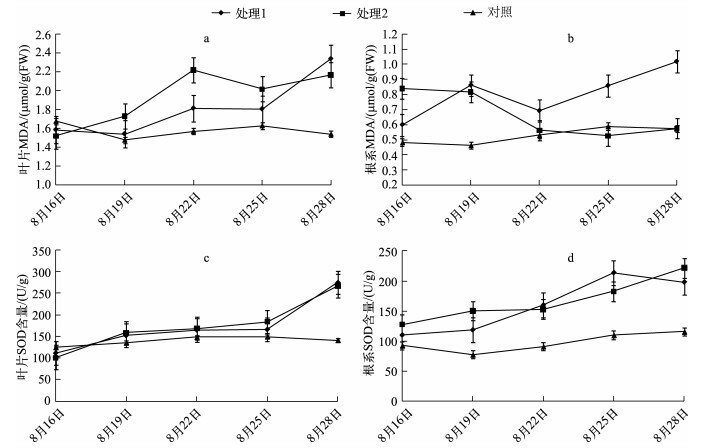 The changes of key enzymatic activity of the water hyacinth indicated that the adverse environment, which formed the anoxia, higher salinity, and strong stress environment after the algae blooms gathered, was harmful to the plant. A longer time(>5d)under adverse environment of formed algae cells had produced irreversible damage to the plants. The strong environmental impact after the algae cells gathered and decomposed on the aquatic plant is the key factors of the death of the plant. There should be avoided the algae serious accumulation of the algae blooms and aviate the injury of the cyanobacterial blooms to the aquatic plants, and we should give full play to purify the polluted water in the ecological restoration of the engineering practice by using floating plants. 测定时把植物叶片、须根从液氮罐中取出，取0.5g叶片加3ml pH值为7.8、50mmol/L磷酸缓冲液(含1 % PVP, 0.2mmol/L EDTA)及少量石英砂，于冰浴中用匀浆机研磨、提取，匀浆液于15000转/min下4℃离心20min，取上清液用于相关指标测定. 植物根系中MDA含量则呈现不同的变化趋势，处理1表现为先增加、后降低、再增加的变化趋势，这可能是初始阶段根系受损死亡，在后期长出部分新根受逆境胁迫导致MDA含量较高.在实验进行3d后增加为0.86μmol/g(FW)，在第6d降低为0.69μmol/g(FW)，随后开始快速增加，至实验结束时高达1.02μmol/g(FW)，这种现象可能是植物根系对藻华细胞刚聚集时的逆境产生的一种自我应答响应；随后大量的藻细胞开始腐烂，产生严重的胁迫，植物根系死亡，导致MDA含量下降；在度过了适应期后，植物新根系长出后，虽然环境胁迫仍然存在，但植物根系能够继续生长，因此表现为根系中MDA含量很高.处理2中藻华细胞聚集最为严重，其造成的环境胁迫作用也最为强烈，其根系中MDA含量表现为实验开始后就下降的变化趋势，至实验结束时其含量降为0.57μmol/g(FW)(图 2b).植株根系中MDA含量的持续降低表明在藻细胞聚集后产生的厌氧、强还原环境和高NH4+-N含量等环境对植物根系产生了不可逆的胁迫作用.丙二醛含量是植物细胞膜质过氧化程度的体现，丙二醛含量高，说明植物细胞膜质过氧化程度高，细胞膜受到的伤害严重，同时也会告诉机体需要进行更激烈的胁迫应答反应来保护机体，其积累是活性氧毒害作用的表现，也是判断植物衰老与膜脂过氧化的一种指标.本研究表明，在蓝藻严重聚集后产生的厌氧、强还原和高盐度等环境胁迫下，植物叶片和根系内膜脂过氧化产物-丙二醛的含量在实验后期快速升高.由于根系最先和最直接受到逆境胁迫影响，因此在藻细胞聚集后水葫芦根系中SOD含量就出现了快速升高(图 2)；随后受逆境条件影响，水葫芦根系中SOD含量呈现稳中有升的变化趋势.植物叶片中SOD含量变化具有滞后性，但在外界逆境胁迫积累到一定程度后叶片功能受到影响，从而导致叶片中SOD含量出现快速增加现象.丙二醛含量的增加常被看作衡量活性氧对植物体防御系统破坏程度的一个准确的衡量指标.因此，藻细胞聚集后，植物根系内MDA含量立即增高，且随着藻细胞聚集程度而增加，其叶片、根系内MDA含量比对照组分别增加了115 %和112 %，说明藻细胞聚集后形成的恶劣环境不但引起了植物根系内严重的膜脂过氧化现象，而且对植物叶片也产生了显著影响. 蓝藻水华的频繁暴发不但对当地水体的景观、旅游、饮用水水源等产生不良影响，而且对水生植被产生重要影响，以太湖为例，2004-2007年，太湖水华蓝藻的最大聚集面积从196.8km2上升到979.1km2.而与此同时，全湖水生植被的覆盖面积从482.2km2下降到364.1km2，总生物量下降23 % .而且受风向、湖流等影响，蓝藻水华常在下风向水域发生堆积，这种堆积常具有时间短、浓度高的特征，在高温作用下常出现短期内大量死亡，造成水体缺氧甚至形成藻源性“黑水团”现象，对水体污染产生质的变化，从而导致下风向水域中水生植被生物量显著降低.相关研究表明，蓝藻聚集对水生植被的生存、发展产生了重要影响，而在当前多地开展的以水葫芦为代表的水生植物的生态治理中，也发现藻华聚集、快速死亡后对水葫芦的生长、扩繁产生了严重影响，甚至出现死亡的现象.通过本研究发现，藻华细胞快速死亡后形成的缺氧、还原和高NH4+-N环境对水葫芦根系产生了不可逆的毒害作用，从而导致植物体内POD、SOD、CAT、MDA含量快速变化(图 2、3).随着藻细胞腐解、环境持续恶化和对植物毒害的持续影响，导致在处理2中植物无法抵消这种逆境胁迫而死亡.通过对植物体内几种关键酶和藻华聚集后引起的主要环境因子变化之间的Pearson相关性分析(表 1)表明，植物体内酶活性变化与根区水体DO浓度、Eh呈负相关(P＜0.05)，与水体中NH4+-N浓度呈显著正相关.表明在水体产生缺氧、还原环境中，几种关键的抗氧化酶含量增加；而水体中NH4+-N浓度增加将会对植物产生毒害作用，植物为了抵消该种逆境的不利影响，通过调节体内抗氧化酶的活性，以抵消不良环境胁迫对植物产生的毒害作用.其中植物体内POD含量与水体中DO浓度和Eh均呈极显著负相关(P＜0.01)，由于植物正常代谢过程和在各种环境胁迫下均能产生活性氧和自由基，活性氧和自由基的积累引起细胞结构和功能的破坏，而超氧化物歧化酶是活性氧清除系统中第一个发挥作用的抗氧化酶，表明植物体POD酶活性对水体DO浓度和Eh变化的反应更为灵敏，从而有助于植物消除外界不良影响.但在藻华细胞严重聚集环境下，植物在无法抵消逆境影响时，根系将会受到毒害而逐渐死亡.这也表明在藻华暴发堆积严重的水域中，植物生长环境的严重恶化是水生植被包括漂浮植物死亡的主要原因. 钟继承, 刘国锋, 范成新等. 湖泊底泥疏浚环境效应:Ⅰ.内源磷释放控制作用. 湖泊科学, 2009, 21(1): 84-93. 陈超, 钟继承, 范成新等. 疏浚对湖泛的影响:以太湖八房港和闾江口水域为例. 中国环境科学, 2014, 34(8): 2071-2077. 贾锁宝, 尤迎华, 王嵘. 引江济太对不同水域氮磷浓度的影响. 水资源保护, 2008, 24(3): 53-56. 叶春, 金相灿, 王临清等. 洱海湖滨带生态修复设计原则与工程模式. 中国环境科学, 2004, 24(6): 717-721. 严少华, 王岩, 王智. 水葫芦治污试验性工程对滇池草海水体修复的效果. 江苏农业学报, 2012, 28(5): 1025-1030. 刘国锋, 张志勇, 严少华等. 大水面放养水葫芦对太湖竺山湖水环境净化效果的影响. 环境科学, 2011, 32(5): 1299-1305. 吴婷婷, 刘国锋, 韩士群等. 蓝藻水华聚集对漂浮植物水葫芦生理生态的影响. 环境科学, 2015, 36(1): 114-120. 何浪, 商兆堂, 秦铭荣等. 太湖蓝藻密度消长的规律分析. 苏农业科学, 2012, 40(6): 333-335. 刘国锋, 何俊, 范成新等. 藻源性黑水团环境效应:对水沉积物界面处Fe、Mn、S循环影响. 环境科学, 2010, 31(11): 2652-2660. 李合生. 植物生理生化实验原理和技术. 北京: 高等教育出版社, 2000. 孙小静, 秦伯强, 朱广伟. 蓝藻死亡分解过程中胶体态磷、氮、有机碳的释放. 中国环境科学, 2007, 27(3): 341-345. 李秋华, 林秋奇, 韩博平. 广东大中型水库电导率分布特征及其受N、P营养盐的影响. 生态环境, 2005, 14(1): 16-20. 周庆, 韩士群, 严少华等. 凤眼莲对铜绿微囊藻生长及藻毒素与营养盐释放的影响. 环境科学, 2014, 35(2): 597-604. 何虎, 何宇虹, 李宽意等. 蓝藻堆积和螺类牧食对苦草生长的影响. 生态学报, 2012, 32(17): 5562-5567. Pérez-Harguindeguy N, Díaz S, Garnier E et al. New handbook for standardised measurement of plant functional traits worldwide. Australian Journal of Botany, 2013, 61(3): 1-68. 任安芝, 高玉葆, 陈悦. 干旱胁迫下内生真菌感染对黑麦草叶内几种同工酶的影响. 生态学报, 2004, 24(7): 1323-1329. Rivero RM, Ruiz JM, Garca PC et al. Resistance to cold and heat stress:accumulation of phenolic compounds in tomato and watermelon plants. Plant Science, 2001, 157: 315-321. Zhang J, Cui S, Li J et al. Protoplasmic factors, antioxidant responses, and chilling resistance in maize. Plant Physiology and Biochemistry, 1995, 33: 567-575. 邓旭, 王娟, 谭济才. 外来入侵种豚草对不同环境胁迫的生理响应. 植物生理学通讯, 2010, 46(10): 1013-1019. 董合忠, 唐薇, 李振怀等. 棉花缺钾引起的形态和生理异常. 西北植物学报, 2005, 25(3): 615-624. 刘国锋, 范成新, 钟继承等. 风浪作用下太湖改性沉积物对藻体絮凝去除效果研究. 环境科学, 2009, 30(1): 52-57. 刘伟龙, 胡维平, 陈永根等. 西太湖水生植物时空变化. 生态学报, 2007, 27(1): 159-170. Fester T, Schuster W. Potato mitochondrial manganese superoxide dismutase is an RNA-binding protein. Biochemistry & Molecular Biology International, 1995, 36(1): 67-75.